DESCRIPTION: Oil free; Won’t clog pores; With rose water and honey; Cleans & nourishes for naturally bright skin. 1. Rose water helps wash away dullness causing impurities. 2. Natural glycerin and honey help nourish your skin. To leave your skin Clean, Clear and naturally bright. DIRECTIONS: Apply a small amount on wet palm and work into a rich lather. Gently massage onto face, avoiding eye area. Rinse off thoroughly. Use twice a day for skin that’s clean, clear and beautiful. Water, glycerin, sodium laureth sulfate, lauryl glucoside, acrylates/c10-30 alkyl acrylate crosspolymer, citric acid, sodium benzoate, fragrance, tetrasodium edta, capryloyl glycine, o-cymen 5 ol, sodium benzotriazolyl butylphenol sulphonate, sarcosine, honey, sodium hydroxide, rosa damascena flower water, cinnamomum zeylanicum bark extract, cl 14700, cl 17200, potassium sorbate. COST: 100ml for INR 110, 50ml for INR 60. It doesn’t lather much when compared to the other face washes of the same brand, but is enough to clean the face quite effectively.. I have even used it for quite a few times during Summer ( When my face becomes an oil well! 😀 ), and found that it still didn’t aggravate the acne, instead it removed all the oil and dirt without making my face dry! 1. Affordable and one bottle goes a long way… Buy it from here! 2. Suitable for all skin types. Dry skinned people would love it, but it even suits the oily skinned! 4. Doesn’t make face oily. 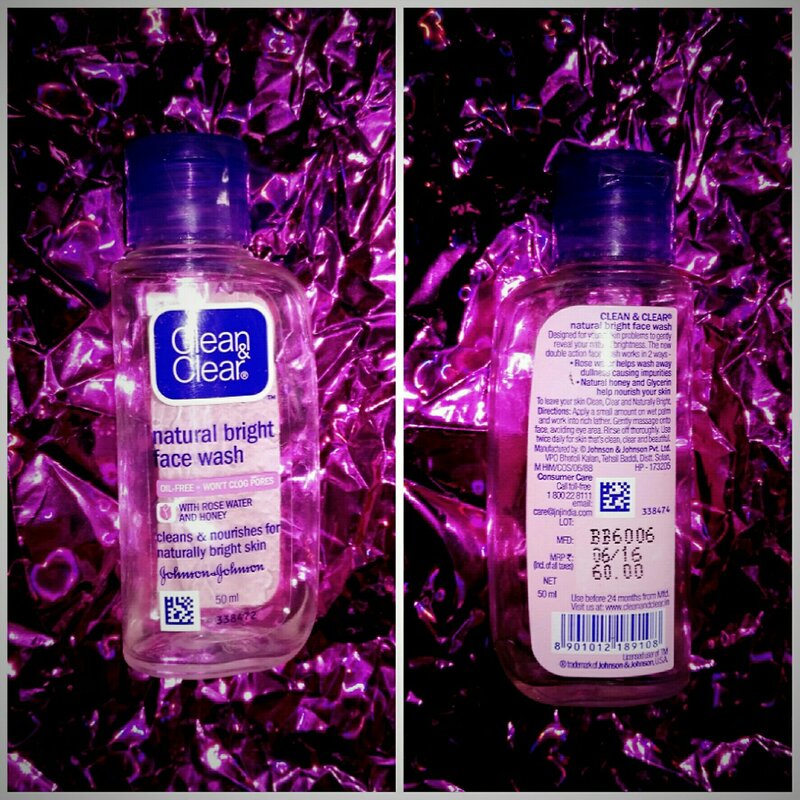 Clean and clear provides quality products and their face wash is best one. I feel every girl must try this. I used to use this clean and clear facewash. I love the way it gives a squiky clean skin after each wash.. This looks good facewash for oily skin for winter season. I’ve never tried this and have oily skin too. Would love to try this soon. Clean and clear is one brand which never disappointed me. I have tried many variants if face washes from this brand. Clean and clear is a really good brand! I have been using this one since a long time, it is really great for oily skin, this is my personal experience…. Clean and clear face wash is really good. I have tried it before and I know how good it is. Great review. Clean and Ckear face wash was a part of my kit for a long time. It’s not costly and Travel friendly. Clean and Clear is a trusted brand and we regularly use it. I have not tried this product but looking forward. I have used this face wash during my 20s and it really helped in reducing ance and clearing out the oil residue from the skin. However, now this face wash dries out the skin in later 30s hence I switched over to milder versions. The Clean & Clear range of products have always been my go-to ever since I first dabbled in skin care. They are fail-safe products. Thanks for sharing your review. As usual, a great review. I have also used this facewash and it suits well for my skin all round the year. I haven’t used clean and clear yet but have heard that it is an amazing product. And after reading your blog I’m definitely going to try. Thanks for sharing this article. I have used Clean And Clear Natural Bright Face this is really very good product. this product is also affordable too. I agree, it is really good and affordable! That’s really a nice and detailed review of the every college goer’s favourite face wash. I’ve personally used this as well when I was in college and I used to love it! I m user of clean and clear moisturiser for so long and i really liked the brand. Wl buy Face wash too.